The RSPCA is investigating after a cat had to have a leg amputated after being shot with an air rifle. Ten-year-old Smudge is thought to have been shot near to her home in Stanway Road, in Earlsdon, Coventry, sometime between 7am and 8am on Wednesday, April 12. When she returned home, she had a small wound to her left fore leg and was immediately taken to a vet, where an x-ray showed that an air gun pellet had become embedded deep within her skin. RSPCA inspector Louise Marston said: “The pellet had completely shattered her bone, and as a result she had to have her injured leg amputated. “Poor Smudge was in so much pain and very distressed. Sadly she has now lost a leg as a result of someone deliberately targeting her. 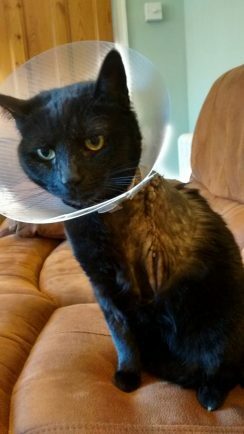 “I am keen to find out who did this as deliberately harming a cat like this is an offence under the Animal Welfare Act. “It angers me that people go to these measures because they don’t like cats, or because they don’t want cats going in their garden, especially when there are many options of humane cat-deterrents available. “With an extreme injury like this, Smudge’s attacked was likely to have been in close range. Inspector Marston added: “It is very distressing to think that people take pleasure in causing such horrific injuries to defenceless animals. These are deliberate and brutal acts of cruelty. “We are supporting Cats Protection’s call for tighter controls on air weapons. This, along with better education and explanation of the law when buying an air gun, and requirements that everyone must receive basic safety training before being allowed to walk out of the shop could help relieve the problem. Last month, the RSPCA released its annual Cruelty Statistics, which showed that inspectors in the West Midlands investigated 6,834 complaints in 2016, compared to 6,579 in 2015 – an increase of 3.8%. Dermot Murphy, Assistant Director of the RSPCA Inspectorate, said: “It continues to outrage and sadden me that people can be capable of such deliberate brutality towards animals, but equally it drives me on to ensure that perpetrators of animal cruelty are put before the courts.